Retired music teacher Paul Dunderdale has been involved with music in various forms throughout his life, learning the clarinet at age 12 and progressing to conductor, arranger and composer by the age of 16, followed by a degree in music in 1971. During the 1970s he tackled a variety of roles including arts administrator, recording studio producer, leader of a folk club and instigator of the Bracknell Folk Festival. Many residents on the Island will recall Paul as a teacher at both Castle Rushen High School and Ramsey Grammar School, and as Music Director of the Isle of Man Wind Orchestra since its inception in 1997 and Onchan Silver Band since 2005. But his flair for composition has given Paul the opportunity to write music for a number of theatre productions, bands and orchestras. 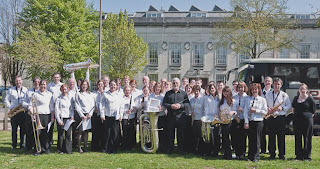 They range from simple arrangements for beginner school ensembles to works for choirs and orchestras by way of wind orchestras and brass bands, with a selection of material available on his website. ‘Manannan’ is a three movement suite for Windband, which began life in 1988 as a piece written for the ‘Castle Rushen High School Wind Band’. Paul commented, “That year had a good band and I wanted to write a piece that they could get their teeth into and which used Manx tunes. At that time Manx music was less easy to come by than it is now, and as I had worked in British folk music in an earlier job I was keen to work with folk tunes”. However, the published version is written for standard instrumentation and has been heavily revised. Selecting tunes to incorporate into ‘Manannan’ gave Paul a good grounding in Manx folk tunes. Paul explained, “The tunes had to work together in the context of the movement, and, whilst movements should provide contrast, they should also work together. There were originally four movements, but one really didn’t fit. It was removed and lives on in a different instrumentation; both pieces are the better for it!” Bearing in mind that the repertoire for wind bands was somewhat narrower 20 years ago Paul used the Vaughan-Williams ‘English Folk Song Suite’ and the two Holst Suites for wind band as exemplars for what was to eventually become ‘Manannan’. At that time Paul was also researching the use of music notation programmes for computer as part of his studies for an M.Ed., and so ‘Manannan’ became a suitable candidate to test the programme he was using. This is Paul’s first suite influenced by Manx folk tunes, with its title inspired by the tune ‘Manannan Beg Mac y Leir’ collected by Mona Douglas. ‘Manannan’ will also soon be available as an arrangement for brass bands. The ‘dropped’ movement, ‘Arrane Ghelbee’, is available as a clarinet quartet to be joined later by two further pieces based on Manx tunes. Enquiries about these can be made directly to Paul at paul.dunderdale@hotmail.com. In due course further examples of his work will be available on a new website which he is in the process of constructing. In the meantime the ‘Manannan Suite’ is currently available priced at £45 from Bandleader Publications.